Penguin, March 2011, ISBN 9781591843795, 224 pp. This is a business book for people who really want practical advice on how to become a better, more successful, happier business person. Unlike many business books, it's neither a relentlessly detailed case study that wears you out trying to absorb lots of detail that may or may not be relevant to your industry and organization, nor a light'n'fluffy "how I inspire everyone around me with platitudes" book. Instead, Guy Kawasaki focuses on practical advice on how to sell your "cause" and how to be someone people want to do business with--how to be "enchanting" to customers, investors, employees. He's a former jeweler who joined Apple in 1983, when he got an early demo of the first Macintosh and was, in his chosen word, enchanted. He uses his own experience and well-chosen anecdotes from others to flesh out his message and illustrate the practical application of his advice. The ten-cent version of that advice, after "have a product, service, or cause that's really worthwhile," can be summed up as: 1. Be likable. 2. Be trustworthy. 3. Be a mensch. Some of the specifics: Smile--a real smile, that moves the eye muscles and not just your lips. Approach people you meet with a goal of helping them first. Tell the truth. Don't shade it to downplay perceived weakness of your position. Instead, address those weaknesses and find a way to meet the real needs of the person you're dealing with. Do that, and you can make a loyal customer for life, not just one sale. Deliver bad news first--because the people you want to work for or do business with want to know the bad news so they can deal with it effectively. Someone who only wants good news is someone to be avoided, in business and in life. Much of this book is applicable to almost any setting, including, as he points out in a few comments, marriage and parenting. The last third of the book is focused more specifically on working inside a corporate or organizational structure, on how to be a good employee and how to be a good boss. There's a short and helpful section dealing particularly with managing volunteers in a non-profit setting. All of which covers the basics of the book, but doesn't capture the experience of reading it. Enchantment really is enchanting to read, enjoyable, enlightening, surprisingly practical, and a book you won't want to put aside until you're finished. I received a free copy of Enchantment for review, from the author. Thank you for this most enchanting review of my book! 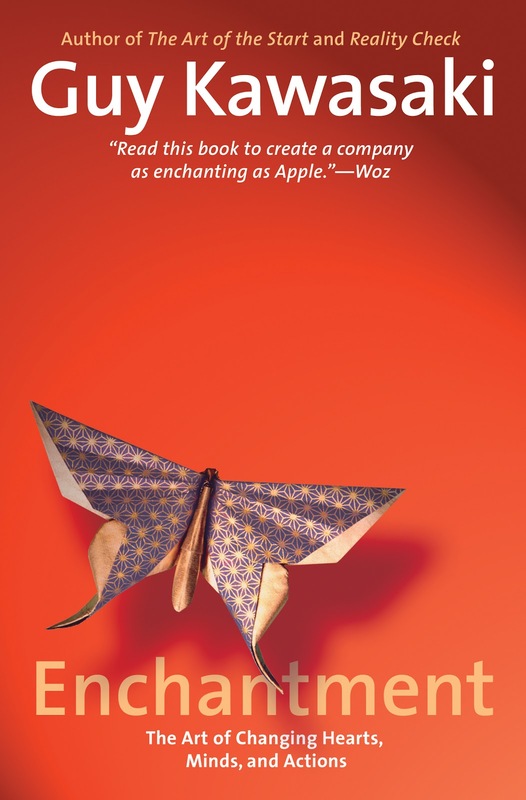 As a fan of Guy Kawasaki I have been looking forward to reading Enchantment: The Art of Changing Hearts, Minds, and Actions. After reading this review, this is a must to for the weekend. Thanks! I know you'll enjoy it. Thanks for stopping by to comment.